This is a fabulous modern four bedroom house design and ideal for families. 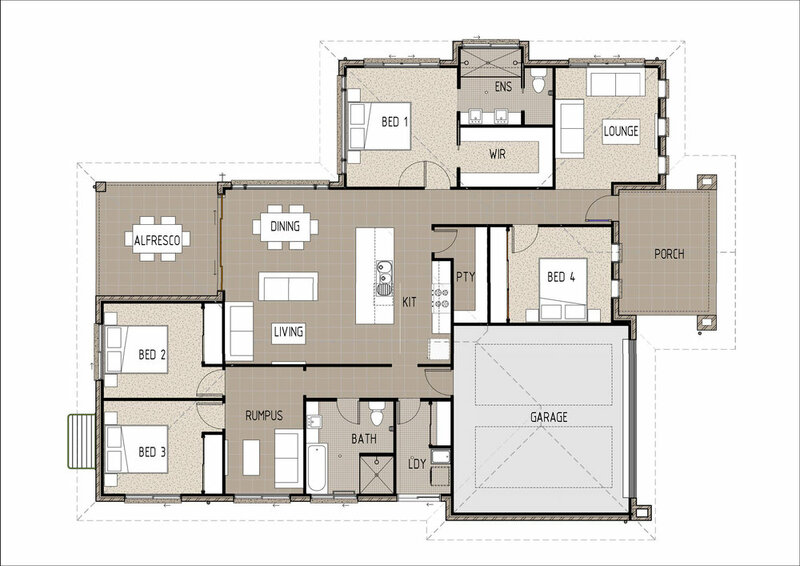 The floor plan includes a master bedroom with large walk in robe and ensuite, as well as three bedrooms with built in wardrobes. The kitchen, dining and living area is open plan and modern with the kitchen boasting a huge walk in pantry and large island bench. The living and dining rooms flow out to an outdoor alfresco which doubles as a source of natural light flowing through to the home. There are also two more separate living areas, a formal lounge room at the front of the home and a rumpus room/kids retreat at the rear of the house. As well as all of the above-mentioned features of the home, the generous and welcoming front porch gives the facade a grand and homely feel.